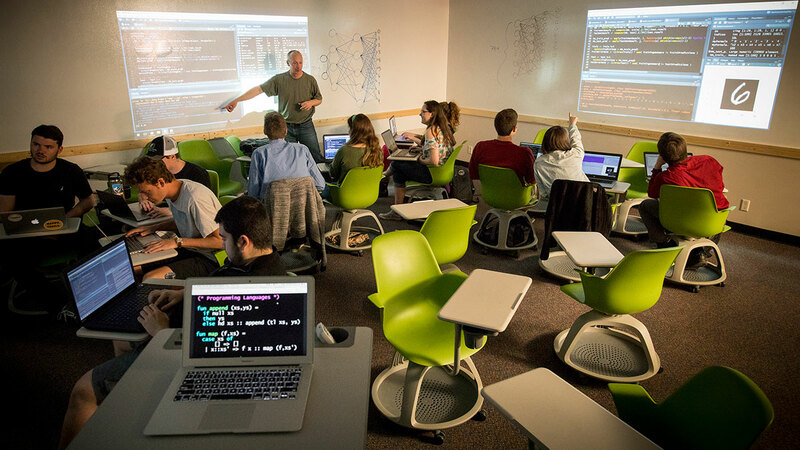 Carroll's Data Science program blends the fields of mathematics, computer science, statistics, and business analytics to provide a unique and integrated learning experience. You will take courses that teach you to gather, wrangle and visualize data, make predictions based off of past behaviors with machine learning, and deal with the massive data sets of today. Your coursework will be blended between computer science, mathematics and statistics, and data science. You will build your communication skills by presenting your course assignments individually and in teams, both in writing and through oral presentations. You can practice what you learn in the classroom by participating in competitions like the Montana Mathematical Modeling Contest (MMMC), and the international Mathematical Contest in Modeling (MCM) and its sister contest, the Interdisciplinary Contest in Modeling (ICM). These fun and intense competitions provide great opportunities for you to test your knowledge and ability to solve real world problems. Why Data Science at Carroll? In the past decades there has been an explosion in both the generation of and the analysis of data. Data science is a rapidly growing field where you will be asked to draw from skill sets ranging across many disciplines to analyze these large and complicated data sets. Our Data Science program gives students this exact background along with the applied and practical experience to get you ready for modern industry-scale data science problems. There isn’t any industry that Data Science hasn’t impacted in the past years, and Carroll’s liberal arts focus will give you a well rounded and deep education that prepares you to jump in to your chosen industry. At Carroll, our Data Science major focuses on blending the statistical, mathematical, and computational skills needed to succeed as a data scientist or analyst. Our small class sizes will guarantee that you have individualized attention and that your professors will be partners in your education. We are passionate about the work we do; we will get to know you as freshmen and will work with you to achieve your individual goals. Our students will be able to use mathematics, statistics, data analysis, and computer science to solve and analyze real-world data science problems. Our students will be able to demonstrate the ability to: create and use computer programs to solve real problems, apply data science tools in a variety of contexts, create models using appropriate statistical methods, and analyze statistical and computational models in applied settings. Our students will be able to communicate their data science work in a clear and effective manner. Our students will be able to demonstrate the ability to solve mathematical, statistical, data science, and computational problems using appropriate technology. The ethical, social, and aesthetic perspectives necessary for value-based judgement and decision making. Questions about data science at Carroll? Click below to contact the department! ...to name a few! The need for data scientists is projected to grow by more than 25% over the next several years, and a Data Science degree from Carroll positions you well to take advantage of that growth in whichever industry you choose. During the first year piloting our Data Science program we already have three students placed into machine learning, data science, and forecasting internships. According to glassdoor.com, data scientist is the #1 best job in America in 2018. According to the 2017 Emerging Jobs Report compiled by LinkedIn, data scientist jobs have grown by more than 650 percent since 2012. A survey showed the average salary for a well-trained data scientist is $121,000.